In this revised version of Origins, physics professors Loren and Deborah Haarsma explore what God's Word and God's world teach us about creation, evolution, and intelligent design. Clearly explaining the science, the authors focus on areas where Christians agree. They also present the strengths and weaknesses of areas where Christians differ. Origins helps you develop a deeper understanding of the origins of the universe and sort out your own views on faith and science. Small group discussion questions follow each chapter. A companion website provides resources for further study. 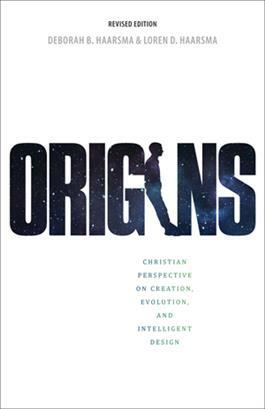 "Origins: Christian Perspectives on Creation, Evolution, and Intelligent Design carefully and thoughtfully explains the diversity of views Christians hold regarding science and faith. The Haarsmas do not hesitate to show how some of these positions are more consonant with our current scientific knowledge than others, and they discuss the special theological challenges each position presents. Meanwhile, the authors stress the importance of a worldview that unifies Christians in recognizing God as not only the Creator but also the Sustainer who underpins science. The Haarsmas masterfully link this to the awe and humility needed to appreciate God as author of the "book" of nature as well as the book of Scripture." Deborah B. Haarsma is a professor of Physics and Astronomy at Calvin College in Grand Rapids, Michigan, where she has been on the faculty since 1999. She earned a Ph.D. in astrophysics from the Massachusetts Institute of Technology and undergraduate degrees in physics and music from Bethel College. Deborah studies galaxies and the universe using telescopes in New Mexico, Hawaii, Chile, and earth orbit. Her work on gravitational lenses and galaxy clusters has been published in "The Astrophysical Journal" and "The Astronomical Journal." Deborah often speaks and writes on astronomy and Christian faith, equipping pastors and churches to engage science. Loren D Haarsma has been an associate professor in the Physics and Astronomy Department of Calvin College since 1999. He earned a bachelor's degree from Calvin College, an M.S. from University of Washington, and a Ph.D. in atomic physics from Harvard University. He then did five years of postdoctoral research in neuroscience in Boston and in Philadelphia. His scientific research is in electrophysiology, studying the activity of ion channels in nerve cells and other cell types. He has written numerous book chapters, articles, and lectures on topics at the intersection of science, philosophy, and religion.